Stop Use Indications: Stop use and ask a doctor if: condition worsens or does not improve after regular use of this product as directed. Inactive Ingredients: Water (Aqua), Sodium Laureth Sulfate Cocamidopropyl Betaine, Sodium Chloride, Dimethiconol, Dimethicone, Helianthus, Annuus (Sunflower) Seed Oil, Glycine Soja (Soybean) Oil, Aloe Barbadensis Leaf Juice (Cucumis Sativus (Cucumber) Fruit Extract, Panthenol, Tocopheryl Acetate, Biotin, Niacinamide, Mentha Piperita (Peppermint) Oil, Elaeis Guineensis (Palm) Oil, Fragrance (Parfum), Carbomer, DMDM Hydantoin, Guar Hydroxypropyldimonium Chloride, Citric Acid, Glycerin, Zinc Sulfate, TEA-Dodecylbenzenesulfonate, Poloxamer 407, Laureth-23, Laureth-4, PPG-9, Butylene Glycol, Iodopropynyl Butylcarbamate, PEG-4, Xanthan Gum, Methylchloroisothiazolinone, Methylisothiazolinone, Ascorbic Acid, Disodium EDTA. Ingredients: Active Ingredient: Pyrithione Zinc (1.0%) Inactive Ingredients: Water (Aqua), Sodium Laureth Sulfate, Cocamidopropyl Betaine, Sodium Chloride, Dimethiconol, Dimethicone, Helianthus Annuus (Sunflower) Seed Oil, Glycine Soja (Soybean) Oil, Aloe Barbadensis Leaf Juice, Cucumis Sativus (Cucumber) Fruit Extract, Panthenol, Tocopheryl Acetate, Biotin, Niacinamide, Mentha Piperita (Peppermint) Oil, Elaeis Guineensis (Palm) Oil, Fragrance (Parfum), Carbomer, DMDM Hydantoin, Guar Hydroxypropyltrimonium Chloride, Citric Acid, Glycerin, Zinc Sulfate, TEA-Dodecylbenzenesulfonate, Poloxamer 407, Laureth-23, Laureth-4, PPG-9, Butylene Glycol, Iodopropynyl Butylcarbamate, PEG-4, Xanthan Gum, Methylchloroisothiazolinone, Methylisothiazolinone, Ascorbic Acid, Disodium EDTA. Instructions: Directions: For best use results use at least twice per week or as directed by a doctor. Massage into scalp and hair. Rinse. I got to try this sample of Dove Dermacare Scalp anti-dandruff 2 in 1 shampoo and conditioner pure daily care and I like it and I would recommend it. When I used it, after I washed my hair with it, I also used a conditioner because my hair gets tangles in it really bad when I just use a shampoo and conditioner combined. It has kind of a minty-medicated scent to it but its not bad, not to me anyway. I like minty scents. Its noticeable but its not strong smelling. Wonderful! for head and hair! I found a small sample size container of this a few months back and put it in my travel case. Finally used it during a trip last month and was I impressed! I've always used shampoo and conditioner separately in the past. But having them together, or This particular formula/combination is a Winner! When first opened, the small bottle had a noticeable scent, but it lessened and was mild when with water during shampooing and after - did not even notice it when drying and styling. After just the first use, my hair was the softest it has been in years! My scalp has 'issues' - after skin cancer surgery and an auto immune disease - finding hair care has been hit or miss. The Dove DermaCare line is the Best, and now this 2-in-1 seems #1. Now I need to find a full-size bottle ... or 2 or 3! 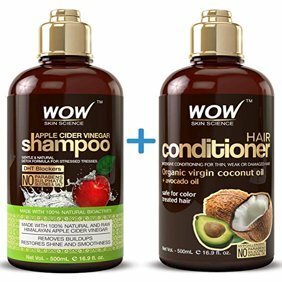 Awesome Shampoo & Conditioner Combo! I first tried this shampoo about a year ago and fell in love with it right away. I am one of the people who washes hair each day to keep my hair fresh and clean. No other shampoo & conditioner combo even come close to how much this product has cared for my scalp. I use to buy this product on my local stores but now they are not selling them anymore. Anytime I buy I will stock up as many as I can buy. If you have problem with your scalp (flaky, itchy, etc) I suggest to try this product. I really hope Dove continue making this product in the future.